4 Bedroom Detached House For Sale in Heathfield for £1,250,000. 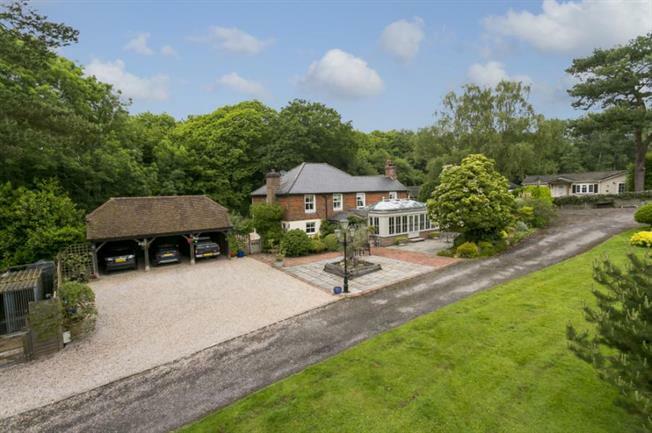 Set within park like grounds at the end of its own half mile private driveway with no immediate neighbours, Stonelands Farm offers a wonderful spacious family home and exceptional equestrian facilities with outbuildings all within 11.25 acres. As with the whole farm, the main residence has been completed to a high standard throughout with solid oak doors, sash windows and wonderful views. The accommodation offers a stunning Amdega Orangery with double doors out to a secluded terrace, double aspect sitting room with inglenook fireplace and impressive 'Bresumer' beam, formal dining room, cosy snug with open fireplace, and a spacious farmhouse style kitchen with AGA range cooker with a gas and electric side module, granite worktops, central island, breakfast area, utility room, and a downstairs cloakroom/w.c. Stairs rise to the spacious first floor landing where all the bedrooms enjoy wonderful views over the grounds. The master bedroom benefits from an en suite bathroom and dressing room, guest bedroom with en suite shower room, a further double bedroom, single bedroom/dressing room and a family bathroom. The extensive equestrian facilities include 5 stables, tack room, hay barn, tractor barn, 40 metre menage and a number of paddocks. There is a further secure four bay garage, a two bay garage with a home office above, three bay oak framed car port under a clay tiled roof, two room annexe/games room with kitchenette and w.c, and a fully renovated one bedroom park home which offers income potential or would be ideal as ancillary accommodation for a relative or staff. The gardens have been beautifully landscaped and include a stylish Portuguese brick paved patio, rolling lawns, a mature rockery, and a number of specimen trees including a 300 year old olive tree. Stonelands Farm is situated on the outskirts of Heathfield near the village of Horam, which has a number of shops for most everyday needs; a post office, a public house and a garage. Within two miles of the property is the Horam Golf Club, Tennis Club, Rugby Club and the Isenhurst Country Club. The market town of Heathfield is about 2.5 miles north and offers a wider range of facilities including banks, post office, library and two supermarkets. There are mainline stations in Buxted, Stonegate and Lewes. Buxted to London Victoria (1hr 20mins), Stonegate to London Charring Cross/Cannon Street (65 mins) and Lewes to London Victoria (65 mins). Lewes is a thriving county town and together with Brighton and Hove, provides excellent recreational and cultural facilities. The internationally renowned Glyndebourne Opera House is about 11.5 miles to the east, Royal Tunbridge Wells lies some 17 miles to the north, offering a comprehensive range of shopping and recreational facilities. The nearest private school is St Leonards Mayfield (girls only). There is also a prep school nearby at Five Ashes (Skippers Hill) and St Bede's is at Dicker. Lewes has some excellent state schools, and there are many well respected and established private schools in the area, including Lewes Old Grammar School, Brighton College, Burgess High School and Hurstpierpoint College.